Topology can furnish concepts with which we can articulate sound using notions of proximity, convergence, limit, continuity, (dis)connectedness, transform, and novelty, without recourse to number, metric, or any discrete schema. The motivation for this work is to develop concepts more adequate than geometric (locally Euclidean) models for media that are thoroughly temporal. Phenomenology can provide a useful complement to a hard choice between "objective" models of audio, and theories of hearing that try to replace "subjective" experience by psychological, neural, or cognitive models. Rather than pretend to answers, I will introduce some concepts from topology and some phenomenological comments on senses of space, body, movement. Then we'll open the discussion to some edge phenomena in spatial audio. We'll also probe for converse insights regarding movement and gesture. Sha Xin Wei, Canada Research Chair, media arts and sciences; Associate Professor, Concordia University, Montréal. 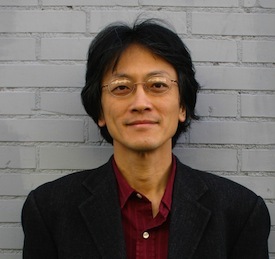 Dr. Sha directs the Topological Media Lab, an atelier for the phenomenological and computational study of gesture and materiality in responsive environments. Trained in mathematics at Harvard and Stanford, Sha has worked in mathematical modelling, simulation, and multimedia. He has been faculty or visiting scholar at Harvard, MIT, Stanford, Georgia Tech, Aberdeen, University of California. Sha is an editor of AI and Society; Rodopi’s Experimental Practices in Art, Science, and Philosophy; and FibreCulture. His book, Poiesis and Enchantment in Topological Matter, is in preparation with MIT Press.